I’m back! Sorry for the long break. I was cleansing and then I got strep throat and then I went on vacation! The vacation was a much needed break and allowed me to get a few recipes down on paper, so here is the first of them with more to come. I hope to also share some details about our active vacation in a later post. For now, I hope you enjoy the new recipe! This recipe is adapted from Gwyneth Paltrow’s Chicken Burgers, Thai Style in her book “It’s All Good”. It’s a great recipe book and it has a few go-to recipes that I make often. I have made a few changes to her recipe but wanted to give her credit for inspiring my modified creation. I have substituted turkey thigh meat for the ground chicken as it holds together better. I’ve also tried to simplify the burger recipe to make it more approachable. 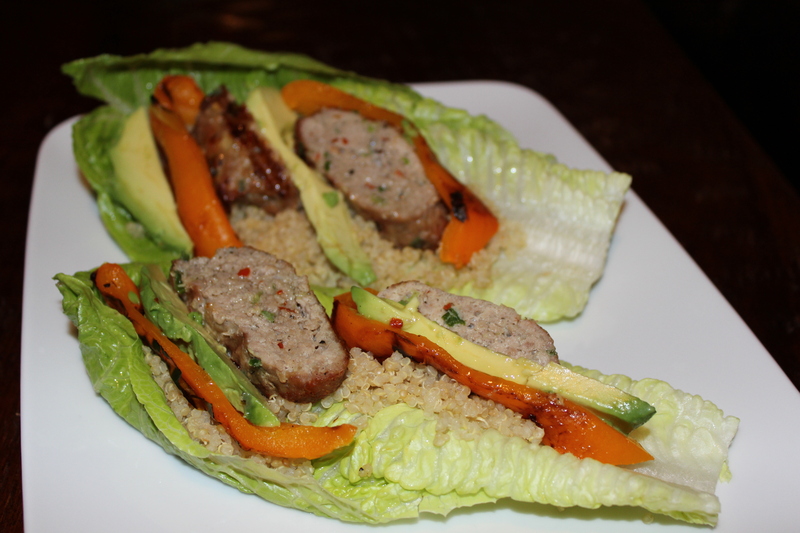 I recommend you try her version as well, but here is mine and I hope you enjoy them in the lettuce wraps. I love lettuce wraps in the summer. The fresh crunch of the lettuce with these spices makes it a great summer dish – much lighter than your traditional burger on a bun. These are also great sliced into a brown rice bowl with similar toppings and some sautéed greens as a side. Leave out the quinoa. Or a better option, once a month, make a large batch of quinoa and brown rice and freeze it in quart sized freezer bags. When you need some and don’t have time to prepare it, just thaw a frozen bag and you are set. Buy a jar of roasted peppers so you don’t have to roast your own. You can toss extras on salads and sandwiches. It would be a shame not to use homemade dressing, I think they taste SO much better than store bought, but an option would be to buy an “Asian style” dressing to use instead. I get it, we are all time crunched. And, as mentioned below, you can make these burger patties ahead of time and let them marinate. You might even freeze the raw patties and pull them out as-needed. Or, a better option that I’ve done a number of times: I double the recipe and then freeze the cooked burgers for a super quick week night meal. Grab the frozen burgers and rice or quinoa from the freezer in the morning and put them in the fridge to get them thawing. This helps speed up dinner that night! Please share any other ideas you have for enjoying these burgers in the comment section. I love to hear new ideas! Begin preparing the quinoa per package directions. You cook quinoa just like rice (2:1 water to quinoa), and it cooks in only 15 minutes. In a medium bowl add all of the burger ingredients and squish together by hand to blend well. Press into 4-5 patties and set on plate. If you have time to let them marinate, stick the patties back in the fridge for 30 minutes (or as long as overnight). It really helps make them more flavorful, but they are good even if you throw them right on the grill. Place burger patties and the bell pepper halves on a hot grill. Cook the burgers 7 minutes the first side and approximately 6 minutes the second side. Check the internal temperature of the burgers if you are unsure, but do your best not to overcook as this will dry them out. Check the peppers after 5 minutes. Flip and place on a cooler part of the grill if possible. Pull the peppers off after 5 minutes on the 2nd side. You want them soft and slightly dark, but not burned. Once peppers cool a bit, you can peal the skin (if you like) and slice them long ways. Slice or cube your avocado. Once burgers are done, let them rest approx. 5 minutes and then slice into long strips.